The electro-organic synthesis is currently experiencing a renaissance due to the tremendous contributions of various electrocatalytic materials as well as the use of electric current as an inexpensive and suitable reagent to drive the electrosynthetic transformations, avoiding conventional chemical oxidizers or reducing agents. Consequently, electrosynthesis has a significant technical impact, because these processes can be easily scaled up, benefiting from advantages such as versatility, environmental compatibility (possibility of recovering and recycling non-converted substrates), automation (switching on or off electric current), inherent safety and potential cost effectiveness among others. 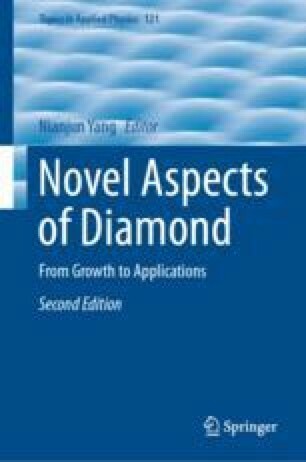 Although many novel electrode materials have been developed and established in electro-organic synthesis, diamond films emerge as a novel and sustainable solution in selective electrochemical transformations for value-added organic products. This chapter aims to offer an overview on the recent synthetic developments which represent hot topics in BDD electro-organic synthesis. Carlos A. Martínez-Huitle acknowledges the funding provided by the Alexander von Humboldt Foundation (Germany) and Coordenação de Aperfeiçoamento de Pessoal de Nível Superior (Brazil) as a fellowship for experienced researcher. The authors highly appreciate the financial support by the Center for INnovative and Emerging MAterials (CINEMA). Support by the Advanced Lab of Electrochemistry and Electrosynthesis—ELYSION (Carl Zeiss Stiftung) is gratefully acknowledged.